These are but a few of the descriptors with which Kelly Barnhill defines herself. She frankly admits that the sum of her former jobs—bartender, park ranger, church janitor, wild-eyed activist, wildland firefighter, and dull-eyed office slave—prepared her for very little, save the telling of stories. And she tells them very, very well. Her forthcoming book, Dreadful Young Ladies and Other Stories (Algonquin, Spring 2018), is her first full-length work for grown-ups—a collection that weaves together the fantastical and the humane. By an author hailed as “a fantasist on the order of Neil Gaiman” (Minneapolis Star Tribune), the nine stories in Dreadful Young Ladies feature bold, reality-bending invention underscored by richly illuminated universal themes of love, death, jealousy, pain, and hope. 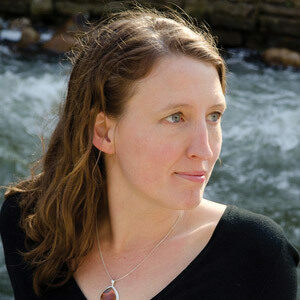 Barnhill is the recipient of fellowships from the Jerome Foundation, the Minnesota State Arts Board, and the McKnight Foundation, and the winner of the World Fantasy Award and the Parents’ Choice Gold Award. She has received a Texas Library Association Bluebonnet Award nomination and an NCTE Charlotte Huck Honor. In addition to being a writer, Barnhill is also a trained teacher who does interactive classroom visits, large-scale lectures and presentations, one-off writing workshops, and in-depth residencies. Whether appearing at local libraries, schools, and bookstores or at universities, conferences, and festivals, Kelly’s presentations are tailored to the needs and interests of the participants, from middle-graders, to middle-agers, to senior citizens. Her wish is that they leave captivated by the wonder and magic of the written word. And that they have a blast in the process. One of my favorite things about visiting classrooms is listening to the questions that the kids have for me. They are simultaneously pointed and obtuse, realistic and surrealistic, pertinent and impertinent. I love them.